How, What & When To Sow Up A Cut Flower Garden In Spring. 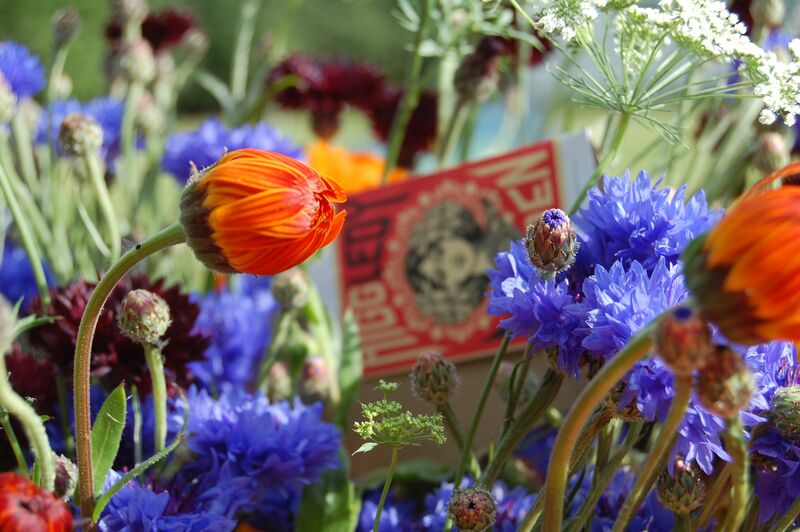 Cornflowers, Calendula & Borage hanging out at Higgledy HQ. In this post I shall be dealing with sowing hardy annual flowers directly into the soil. Hardy annuals generally are the backbone of my own cutting gardens, they are super reliable and will keep producing flowers all season long as I keep harvesting them…if you want ‘bang for your buck’ or ‘bang for your space’ (?!) then hardy annuals are the critters for you. 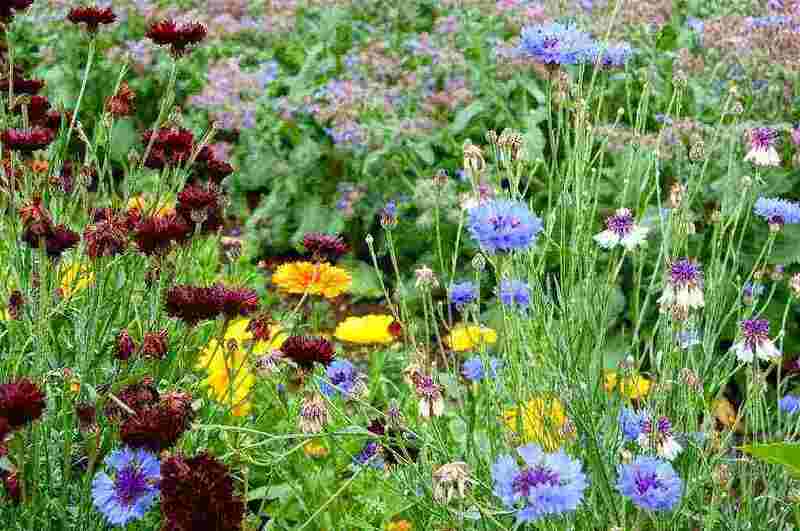 When to sow hardy annuals. 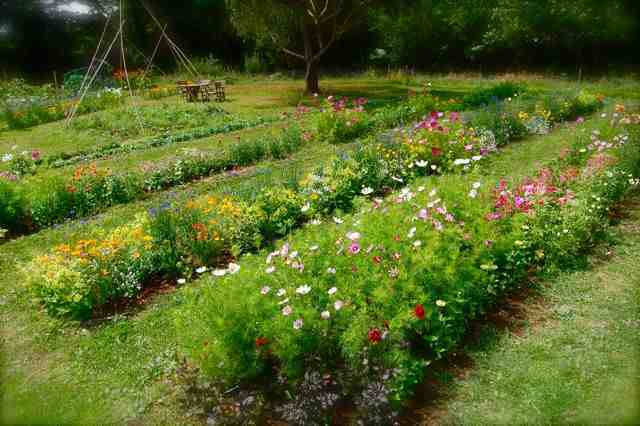 Mixed beds at Higgledy Garden. *There is no point whatsoever sowing your flower seeds if you can’t already see the native weeds emerging from the soil. They both germinate at that same temperature…if the soil is too cold the seeds will just lie dormant and are in danger of rotting or being eaten by the pesky wildlife. *For most of the UK the soil temperatures will be warm enough by about mid April…later in Scotland….earlier in the south west. *One of the biggest reasons of seed germination failure is them being sown too early into cold wet soil…FAR better to hold off. *If you are unsure…just hold back a week or so…you will always get better germination at the end of April compared to the beginning. 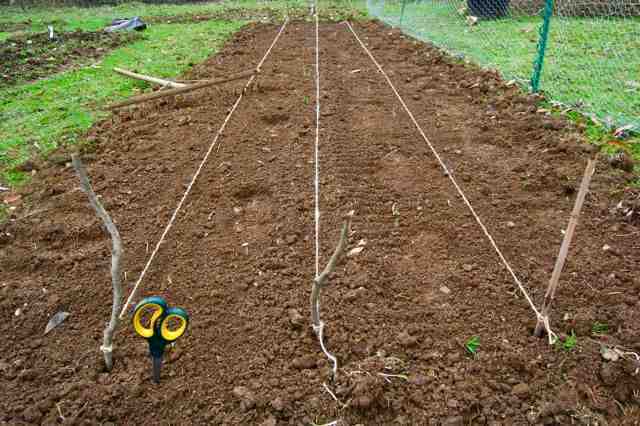 *The other great advantage of leaving off sowing is that you can hoe off the first couple of flushes of weeds….this will save you time weeding later on…it is considerably easier to hoe a bed when you don’t have to navigate tiny flower seedlings. *I know we will all be keen to get started early…but really…you may sense the springtime charging forth…but wait until you can see the whites of her eyes before you sow up your patch. How To Sow Up Your Cutting Patch In Spring. Three rows is a swimmingly good number. *My own method is very straight forward. My beds are three feet wide and as long as the space allows. It will make your life much easier if you can reach the middle of the bed from each side…three foot seems perfect. *I simply dig the bed until it is thoroughly free of all weeds….weeds are planty pirates….they will steal light, water and nutrients from the more vulnerable flower seedlings. Remember our native weeds have been at this game for millennia…this is their territory and they have become adept at growing in it…get them gone….there is plenty of room for them elsewhere in the garden. *Make three equally spaced SHALLOW drills. I use a taught piece of string and then run a stick gently along it. Take your time over this bit… The rows should be spaced a foot apart. *Water these drills BEFORE you sow…this ensures your seeds don’t get washed away if you water just after sowing. Grown in single varieties….calendula, Godetia and Cornflowers. *Most seeds will have germinated in a couple of weeks….but sometimes they may take as much as four weeks. Keep on top of the weeding. *When the seedlings are about an inch high thin them out to about a foot apart, which suits most annual flowers. My Higgledy Flower Seed Shop. *Twelve weeks from sowing you will start to get flowers….then at fourteen weeks you will be overrun with them and all will be good with the world. *Keep harvesting the flowers even if you don’t want them….failure to do so will tell the plant it’s work is done and to go to seed….at which point it will stop producing flowers. 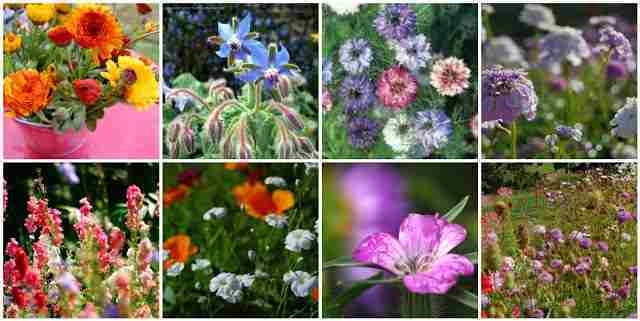 Which Flowers Can Be Sown In Spring For The Cutting Garden? 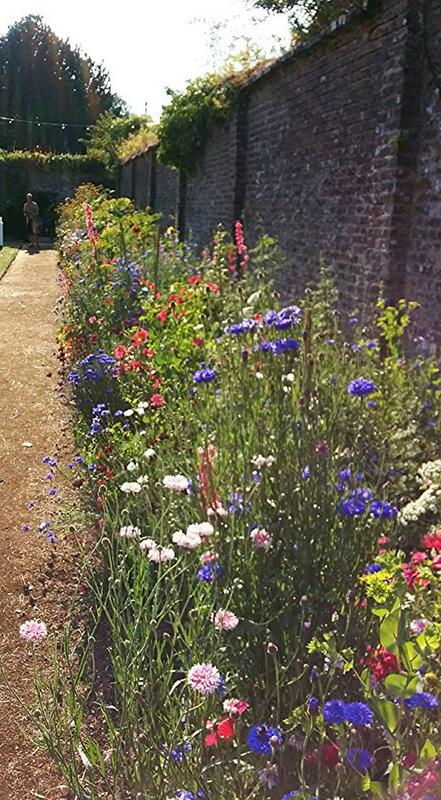 Higgedy Annuals gracing the walled gardens of the Port Eliot Estate. 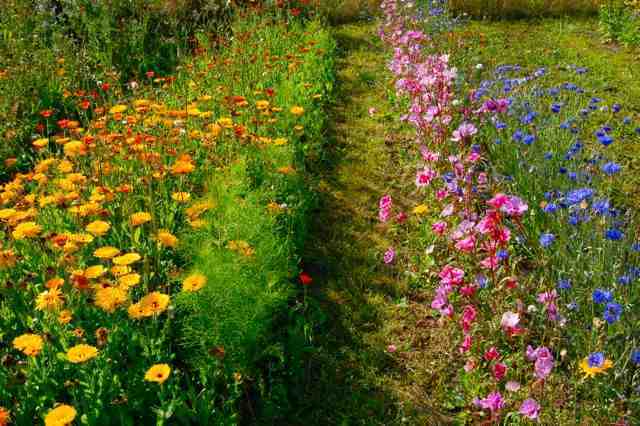 I hope this has been some help to those of you looking to start a cutting patch this spring…it is much more straight forward then you may think and once under way it will pretty much look after itself as long as you keep harvesting the flowers. Feel free to be in touch if you have any questions. I hope you all have a wonderful season. I would be very grateful if you could share this post by clicking one of the social networking buttons below. Many thanks. Unconventional Sweet Pea Sowing. Alice Christie’s Port Eliot Festival Post. Is there any chance you will still honour offer please. Hiya! It’s 1pm on Monday… have I missed the deal?! Im orderingt this seed collection. I have two raised borders my daughter and her partner used for veg last year. They have now got their own home, so I am going to use one border for veg and the other for flowers. you’re keeping a veg bed? ;) Best of luck Gill….let me know how you get on.